Ingredients include Simmondsia Chinensis (organic jojoba oil), pelargonium roseum, asperum (organic geranium essential oil), foeninculum vulgare (organic fennel essential oir), salvia sclareaorganic (clary sage essential oil) and salvia officinalis (organic sage essential oil). No information about the specific amounts of these ingredients in milliliters found in the product are posted in the product source. Shake before use. Rub 1 pump of oil into the inside of your wrists for quick absorption into the blood stream. For external use only. $15.95 for a 2 once bottle. The product source does provide a contact number. The vendor also apparently has a product return policy found in vendor product sale terms and conditions but attempts to locate this section in the product source were not successful. The product source does contain a number of product testimonials. In view of the limited information provided in the product source about Natures Inventory Menopause Support anyone considering purchasing it should either contact the vendor for more information or have a health care professional review the product prior to purchase. 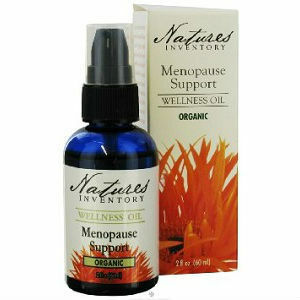 Jackie Horowitz	reviewed Natures Inventory Menopause Support	on October 17th	 and gave it a rating of 2.